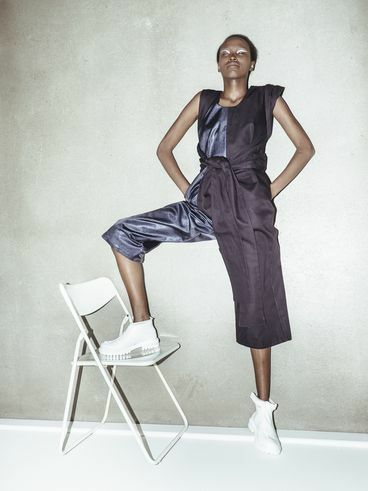 Ayleen Meissner and Eva Sichelstiel work together with young people off the street to create fashion. For the designers the objective is to be open to all kinds of ideas, impressions and flashes of insight, and to then pick up the common thread that can be tied to form a collection. 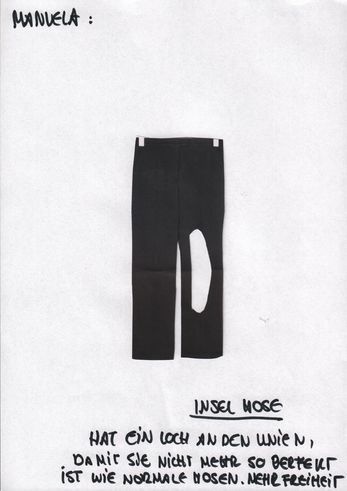 The classy black trousers made from an exquisite fabric have two holes on the knees in a contrasting colour to offer greater freedom. 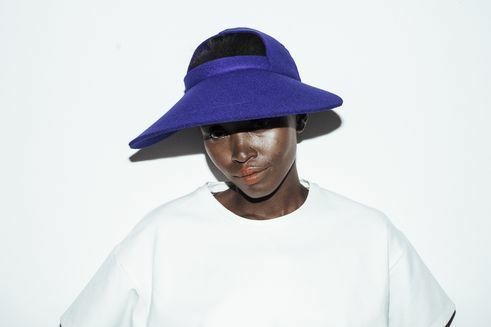 The summer hat in cornflower blue with its wide brim leaves an open gap on the head, and the minimalistic bikini top is embroidered on a long-sleeve shirt. The edition Snow in Summer of the fashion label People Berlin plays with people’s perception in a style-conscious manner, it breaks with the rules and stands out from the usual designs in exaggerated details. But People Berlin is a lot more. “Every garment, every accessory, tells its own special story, and brings with it added social value“, explains designer Eva Sichelstiel. 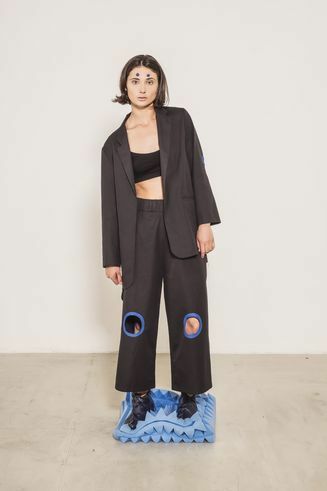 She launched the label People Berlin together with her colleague Ayleen Meissner at the beginning of 2015. 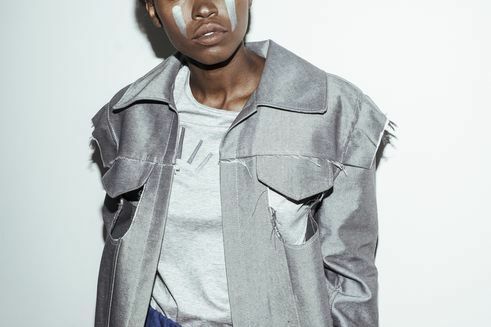 Since then, the two designers have been creating fashion together with young people who live on the street, struggle with drug problems or are in some other kind of trouble. Work on the third edition has just started. 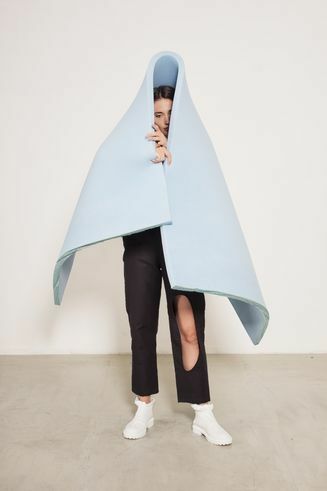 Eva Sichelstiel explains the way they do it: “We experiment with ideas, materials, shapes and colours and then use these to create a concept, initial designs and patterns.“ In the production stage all efforts are then focused on sewing, weaving and embroidering. We follow the same procedures as those practiced by other fashion labels, only at People Berlin we don’t work at the same speed as in fast fashion. From the initial concept up to the finished edition we take almost a whole year. The theme of the new collection is yet to be decided on. “Rebellion” could be a possible option. The idea workshop team gets together in Drugstop, a red brick building in the Berlin-Lichtenberg district, that is run by the social service agency Karuna e. V. Here the young people can eat and take a shower, and also participate in projects that can help them draw a better path for their lives. People Berlin is one of these projects. A long table packed with fashion and lifestyle magazines. Eva Sichelstiel hands out scissors and glue. The week before, the team went to an exhibition on Surrealism. Now they are to cut out and stick collages, without following any logic. “If my mother could see me now …”, mumbles Nico*, while looking for a huge hat to add to his collage. Ella, wearing meticulously applied make-up, finds it difficult to be creative today. The holes in her cardigan – is that supposed to be the trendy destroyed look? “No it isn’t, the holes were eaten by my rats”, the 17 year-old comments, while stroking her dog that follows her every step. Steven glues on a figure with three legs, and goes on to explain how he found a good place to sleep in the university the previous night. Manuel, sitting next to him, is working on a series of collages and gives a passionate talk on world religions. The highlight and end of each project is the sale of the collection in a pop-up store in the trendy Berlin-Mitte district. This is where the young fashion designers, who mainly live on the streets, meet people who are prepared to spend 300 euros on an unusual garment. These encounters help to open up minds and overcome prejudices – “also of the young people themselves“, Eva Sichelstiel emphasises. For its innovative communication of art and culture People Berlin received the 2015 award of the German Federal Government for Cultural Education. 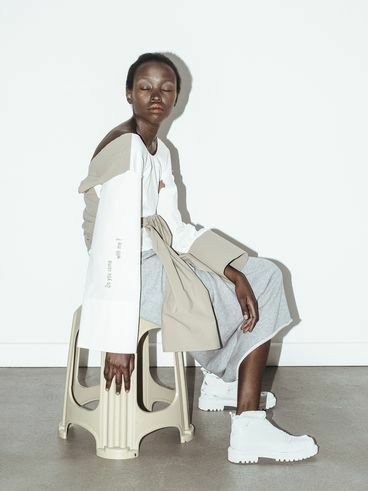 Eva Sichelstiel and Ayleen Meissner both studied fashion in Pforzheim and spent several years working in production, design and PR. “We were quick to raise the question as to the meaning of it all”, says Eva Sichelstiel. “We didn’t want to be part of a machinery that just runs faster and faster.” They went on to develop the label People Berlin and are able to finance this initiative with the support of the Volkswagen Employee’s Foundation. From then on, thanks to their eagerness to experiment and their professional craftsmanship skills they have been able to broaden the interpretation of fashion and what it can be. * The young people’s names in the text have been changed. The institution „Drugstop“ of Karuna e. V.